And I think that there may be some merit to that idea. Recently, however, I received correspondence from Dr. Karl Hutchings, whose work on lithic fractures in stone points has provided strong evidence that atlatls were used by the first people to enter the Americas, even though no direct evidence of atlatl use from that time has yet been found. I also read with interest your thoughts concerning the persistence of the atlatl vs. the acceptance of bow technology. My own thoughts on the matter are a bit different. It may be noteworthy that recent users of the atlatl hunted small game with it. For example, Australian Aborigines hunted small game (e.g., reptiles) with the atlatl (they call it a Woomera of course), and ducks were being hunted with the atlatl up until the 1960s in Mexico. So I don’t think game size per se is necessarily the key factor, though it may figure into it. Instead, I expect that the nature of the terrain (i.e., open vs. forested; rocky vs. “cushioned” [for want of a better word]) and the relative level of human aggression were important factors. The atlatl makes sense in open terrain where the arm motion is unrestricted, and where a long-distance, arcing trajectory is unimpeded. Under such conditions it would be especially beneficial for hunting herd animals. But it would be effective in some other conditions as well. The atlatl is quite effective at close range for hunting small game, but can be hampered by the nature of the “ground cover”. In rocky terrain, one can expect a lot of broken darts regardless whether one hits the small game target, or misses entirely – in either case, the dart is going to hit the ground, since even if the target is hit, the dart will likely continue through it. I suspect that the atlatl is not preferred in such rocky environments, but on soft (e.g., humic, marshy, sandy, or even water) terrain (like the Australian and Mexican examples), this would not be a problem. In contrast, archers may not have experienced as significant a problem in rocky terrain due to the flatter trajectory (i.e., increased inherent accuracy), and reduced “cost” of arrows (relative to much larger darts). The other likely factor is the relative level of human aggression. The bow is, to a great extent, a weapon of warfare due to the low cost of projectiles, the ability to carry very large quantities of projectiles, and the ability to shoot from positions of cover. So, in those areas where the bow was adopted due to interpersonal aggression, it may make sense to abandon the atlatl, and simply use the bow as a dual purpose weapon. Of course, the reasons for preferring one vs. the other are likely even more complex than this, and undoubtedly incorporate concerns of economy, ethnicity, aesthetics, and more. Just my speculations on the issue. Dr. Hutchings’s comments highlight several aspects of my fascination with the Pleistocene period in North America. First, Dr. Hutching’s ideas all make sense to me, and I had not considered any of them. Second, I still think that there is merit to notion that these exceptionally skilled hunters may have adapted a lighter technology to lighter game, as the megafauna disappeared. Why continue to use heavy artillery, as it were, for lighter prey? Of course, the atlatl/dart technology could have been (and was) adapted for use on smaller animals, Dr. Hutchings noted above. Still, I think that at some point, as the darts shrank, it became just as effective and easy to use bows and arrows. This ties in with a point that Hutchings makes above – there is a lower cost to make and replace arrows than darts. Another question is why, after bow and arrow technology was adopted, the atlatl/dart system was apparently no longer used even in against large animals in the open, grassy country that, as Hutchings notes, is optimal for it. I am thinking here about hunting bison or elk on grassland. I understand that the Paleo-Indians at this time had to hunt on foot, and it may be that they could stalk prey more effectively and make better use of cover with a bow, rather than an atlatl, which requires the highly visible standing, throwing motion. Nonetheless, large animals on open terrain remained, but for some reason, the technology shifted from atlatls to bow. Why? Of course, one additional piece of information that might shed some light on this issue is the pattern of settlement/exploration of the continent by the first people here. What did they preferentially hunt? And where, i.e. in what type of terrain? Perhaps as the megafauna disappeared, the Paleo-Indians had to shift to hunting different game, in different terrain, and the change in terrain drove this shift in technology. Ultimately, I suspect that there is no single explanation of this technological shift. Scarcity of good stone may have influenced knappers to make more, but smaller points – who knows? My point here is, the fact that we know so little about life in the Americas thirteen or so thousand years ago is the very reason that it is so fascinating to me, and why I applaud creative scholars like Dr. Hutching who are doing such interesting work. “Atlatl and Dart,” February 19, 2015. Indeed, his work formed much of the basis for the “Atlatl and Dart” entry. Correspondence of February 25, 2015, from W. Karl Hutchings, Ph.D., Assistant Professor, Anthropology (Archaeology), Thompson Rivers University, Kamloops, BC V2C 5N3. Quick! What’s the second fastest land animal in the world? Everyone knows that the Cheetah is the fastest. But who’s number 2? 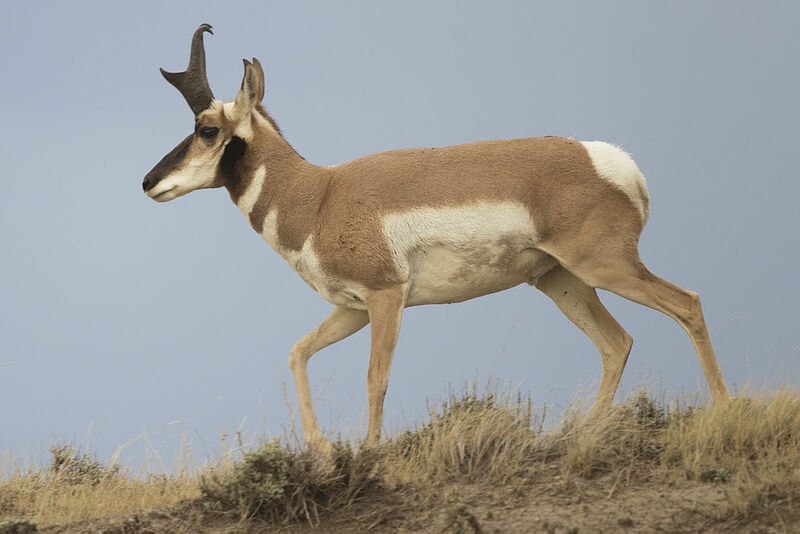 It’s America’s own: The Pronghorn. And what a strange – and unique – animal it is. It looks like an antelope. But it isn’t. Its scientific name is Antilocapra Americana, which means, American antelope-goat. But while the pronghorn shares many of the features of deer, antelopes and other ruminants: a four-chambered stomach, cloven hooves, and a body shape similar to that of antelopes; it is not an antelope, nor a deer; not a goat, not a sheep. It is unique. It is the sole remaining member of the family antilocapridae. Its closest taxonomic relatives are the giraffids (giraffes and okapi). Once, back in the Pleistocene, there were twelve different species of antilocapra in North America. The other species differed in size and horn type from the Pronghorn: Ramoceros had long forked horns, and was much smaller than the pronghorn; Hayoceros had pronged horns above its eyes, like the Pronghorn, but also had another pair of straight horns behind those; Stockoceros had four horns. But they are all extinct – only the Pronghorn survives. They do look like antelopes. Pronghorns range in size from 75 to 130 pounds, and stand about three and half feet high as the shoulders. They are predominantly a rusty-reddish color, with white patches on their bellies and rump, and white stripes on the throat. They flash the white patch on the their rumps to signals others of danger. They mate in the fall, when males fight rivals to corral a harem. And they fight using their odd pronged horns – again something unique to the Pronghorn. You may know that antlers grow each season, and then are shed, only to grow again the following year; while horns on cattle or bison are permanent. The Pronghorn falls somewhere in between. It is the only animal in the world with branched or forked horns; and the only animal in the world to shed its horns. The horn begins with a bony growth, and then grows up over that; and then is shed annually. The horns of the male pronghorn are much larger than those of the female, and can grow to fifteen inches in length. The horns of the females are smaller, and rarely have prongs. In addition to the unusual pronged horns that give the animal its name, the pronghorn has another unusual anatomic feature. It has extraordinary vision. Its eyes are the largest, relative to its size, of any North American ungulate; and it has a nearly 300 degree arc of vision, without moving its head or eyes. Pronghorns see movement more clearly than stationary objects, and can detect movement up to four miles away. The pronghorn is designed for speed, and endurance. Its bones are lightweight, relative to its size; the trachea and lungs are enlarged; and it runs with its mouth open, to take in more air. And the pronghorn’s capacity to utilize oxygen is incredible. 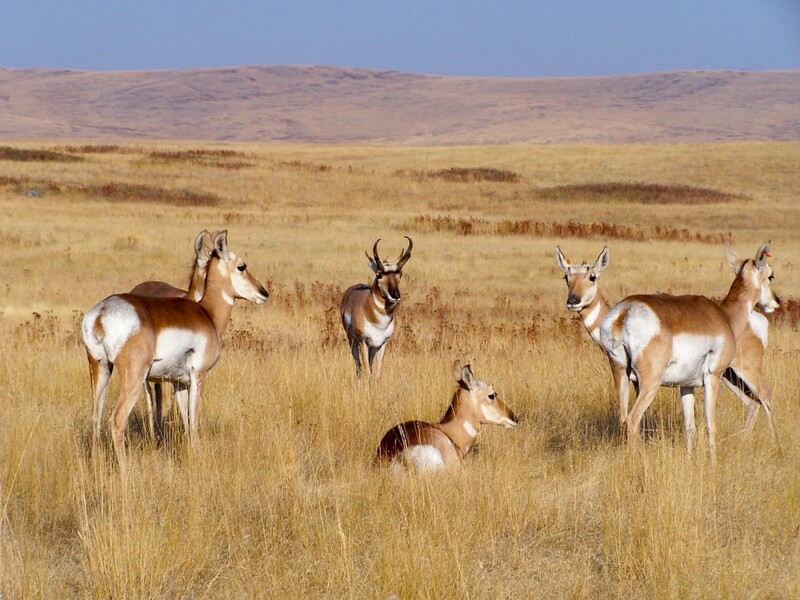 In one test, scientists found that pronghorns use five times more oxygen per minute while running than other mammals of comparable size. But remarkably, the scientists who have studied the pronghorns and their adaptation for speed have found nothing else, really. So why this speed? Why has the pronghorn evolved this unequaled capacity to run at very high speeds for very long times? Why that incredible vision? In a word: predation. Evolution is driven by adaptation. Something drove the pronghorn to develop this unmatched capacity to run and run and run, at high speed, over enormous distances. The question then is this: What nightmare creature had the speed and endurance to drive pronghorns to evolve their exceptional combination of speed and endurance? The answer is: No one is really sure. It wasn’t wolves, and it wasn’t coyotes. Newborn or injured pronghorns are vulnerable to predation by wolves and coyotes. 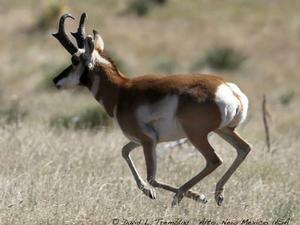 But adult pronghorns are much, much faster than coyotes: They can outrun them easily. Wolves are pursuit predators. 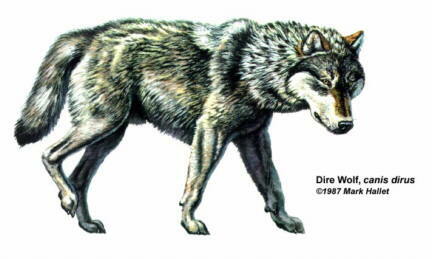 They hunt in packs and employ relay strategies where some of the wolves chase a prey animal, and then others of the pack take up the pursuit, eventually tiring and wearing down the prey so that it can be taken. And this perhaps was an effective strategy against the pronghorn when wolves roamed the same country as the pronghorns do. But for the most part wolves do not prey on pronghorns. They have other prey – elk, for example, and – today, at least – are not commonly found in the type of country where pronghorns roam. Ambush predators like mountain lions don’t have enough cover to successfully stalk and kill pronghorns regularly. So if it wasn’t coyotes, nor wolves, nor mountain lions, what animal was it? What nightmare creature had the speed and endurance to drive pronghorns to evolve their exceptional combination of speed and endurance? There are two primary contenders: The American cheetah, and the hunting hyena. One theory is that the pronghorn developed its remarkable running ability in response to predation by the American Cheetah. The name is not entirely accurate. 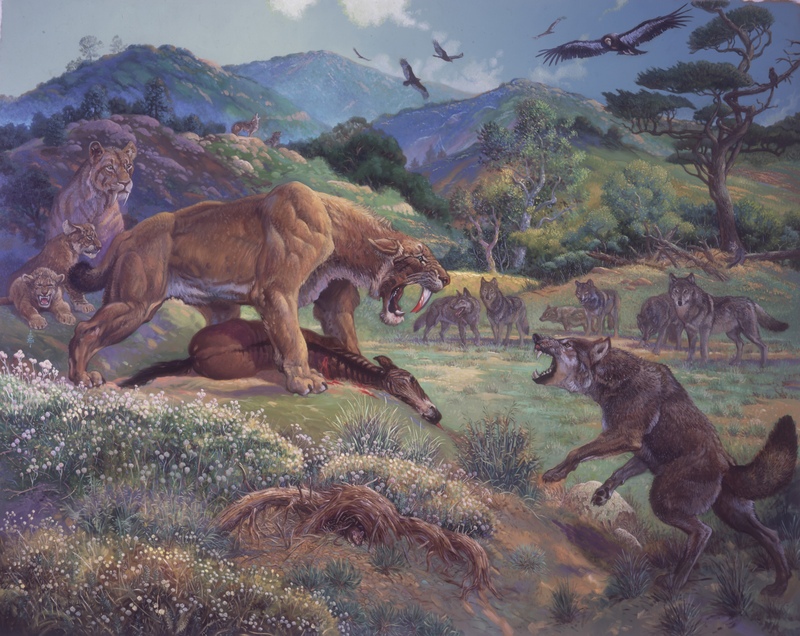 Although they were fast – very fast – the two species of American Cheetahs were not cheetahs at all, but more closely related to mountain lions (cougars). Nonetheless they showed evolutionary adaptations designed for speed. One of them – Miracinonyx trumani – lived on the prairies and plains. It may well have been the pronghorn’s partner in the evolutionary race for speed and endurance. But recently, Miracinonyx fossils have been found in the “wrong” habitat – in steep, rocky hillside areas – leading to some speculation that the American Cheetah lived more like a modern day snow leopard, than its African namesake. And cats tend to be sprinters rather than marathoners. Since the pronghorn can sustain its incredible speeds for such a long time, it seems likely that the running ability evolved in response to pressure from some predator that could run at high speed for long distances. And, in fact, there is another possible explanation for the pronghorn’s speed and endurance: The American hyena, Chasmaporthetes ossifragus, called the hunting hyena. Not much is known about the hunting hyena. It is the only species of hyena to cross the land bridge from Eurasia to North America. “Fossil remains of Chasmaporthetes have been found at 4 sites in Florida, 3 sites in Arizona, 2 sites in north Texas, 2 sites in Mexico, and 1 site in New Mexico. 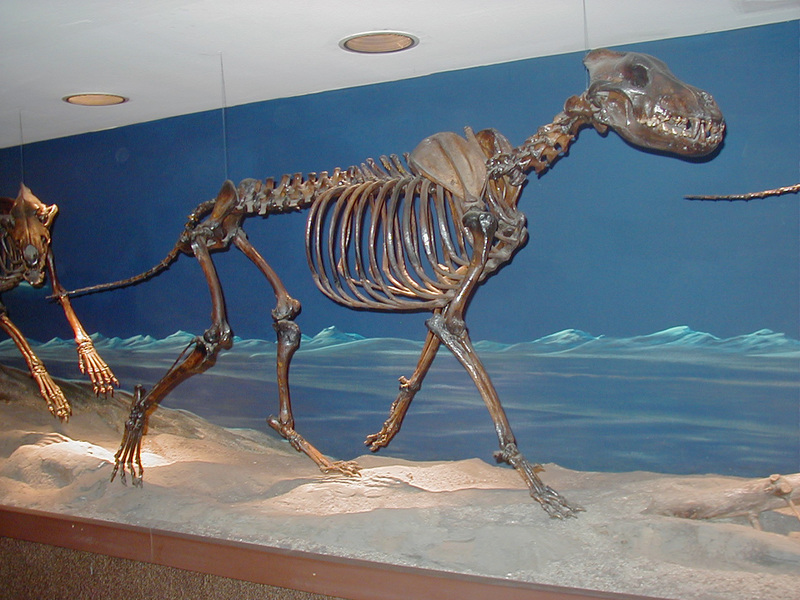 . . Chasmaporthetes is called the hunting hyena because it, too, like the America cheetah, shows adaptations for speed. Its legs were long and slender, and it probably hunted in packs on open grassland. Today, African hyenas are tenacious pack predators, often chasing prey for long distances. Thus is seems possible that the American hunting hyena might have been the pronghorn’s partner in the evolution of this speed and endurance. The American cheetah is long gone now, and the hunting hyena went extinct roughly seven hundred eighty thousand years ago. Still, the pronghorn survives; and still it carries the adaptations it evolved: the vision to see danger from far away, and the speed to run and run and run, as long and as fast as possible, to escape from whatever it was that pursued it – the American cheetah, or the hunting hyena. Whatever it was, it haunts the pronghorn’s dreams still. Wikipedia reports that there were still five species when humans first entered the Americas, although the statement does not have a citation or reference. It has taken 46 years to get the answer. Well, twelve thousand six hundred and forty six, to be more precise. And it’s all due to a little boy. He lived in Montana. Maybe he was a happy, chubby little fellow, toddling about, smiling, learning to talk. We know he was very much loved, because when he died, at about two years old, he was buried with hundred of spear points, and other stone tools, stone points, and his body was painted with red ochre. One thing that is evidence of how much he was loved is that buried with him were carved elk antlers that were hundreds of years older than he was – heirlooms, presumably. He died roughly twelve thousand six hundred and forty six years ago, and was buried, and his people moved on, and spread across the land. And then, forty six years ago, in 1968, his body was found, on a ranch in Montana near the town of Wilsall, northeast of Bozeman. The site is called the Anzick site. It was discovered by accident, and contained many spear points and stone tools, all of them Clovis-type tools, as well as partial skeletal remains of this small boy. But there is something very special about this boy. For he has shared a secret with us. He has told us much about his ancestry, and the ancestry of the Native Americans who live here today. To understand this, let’s step back a little. At present there are two main hypotheses about how people first came to the continent. 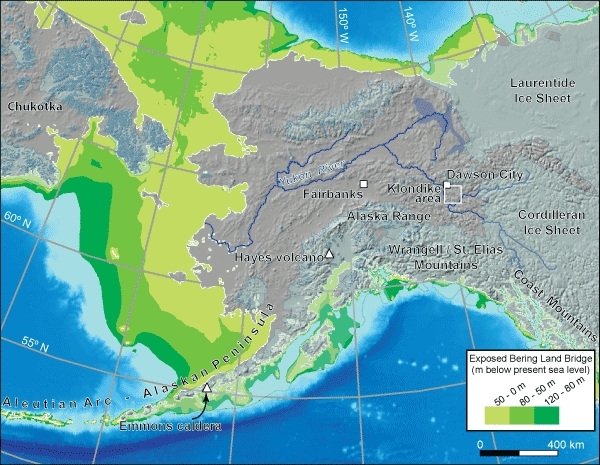 One, the subject of prior blog entries, is that people came from Siberia across Beringia, the vast land bridge that connected Siberia and Alaska. The second, the Solutrean hypothesis, posits that Clovis predecessors came, across the Atlantic from southern Europe, following the edges of the ice during the last Glacial maximum. This would mean that they used hide-covered kayaks, or other similar watercraft. This hypothesis derives, in part, from the similarity of Clovis points to stone tools found in Southern Europe. So: We have two very different hypotheses; two doors to the Continent in essence: One by boat to the East Coast; the other on foot down through Alaska, and south. Here’s where the little boy comes in. Genetic analysis, performed by a team led by Eske Willerslev, a paleobiologist at the University of Copenhagen, has shown that the Native Americans in North and South America have genes consistent with those of people from Siberia. The little boy’s genes show that “the gene flow from the Siberian Upper Palaeolithic Mal’ta population into Native American ancestors is also shared by the Anzick-1 individual and thus happened before 12,600 years BP.” What this means is that those genes are from Siberia. But this little boy, living and dying here in North America, over twelve thousand years ago, had them too. And those genes are shared with modern Native Americans. This boy’s ancestors came from Asia. This is strong evidence in support of the hypothesis that the Americas were peopled via Beringia. Does this mean the end of the Solutrean hypothesis? Well, it is strong evidence, but not necessarily the death knell for the Solutrean hypothesis. After all there is nothing that requires Beringia to be the exclusive means of entering North America. It is possible that people came in across the Atlantic, too. And defenders of the Solutrean hypothesis aren’t giving up. “They haven’t produced evidence to refute the Solutrean hypothesis,” said geneticist Stephen Oppenheimer of Oxford University, a leading expert on using DNA to track ancient migrations. “In fact, there is genetic evidence that only the Solutrean hypothesis explains.” There is a dearth of DNA data from existing Native American populations, so there may be (as yet undiscovered) genetic evidence supporting an inflow of people from Western Europe. One interesting thing about this genetic study is that the little boy’s genes are more closely associated with Central and South American peoples than native Americans from the far north. “The team was able to determine that the Anzick genome was much more closely related to Native Americans than to any other group worldwide. The child’s DNA more closely resembles that of Central and South Americans than Native Americans from the far north, although the relationship is still very close. . . Comparing the Anzick genome with that of a 24,000-year-old Siberian boy and a 4000-year-old Paleo-Eskimo from Greenland confirms that Native Americans originally come from Northeast Asia. Like so much having to do with paleontology and archeology, it is only a piece of the puzzle. But it is an important piece. Thanks to this little boy, and the family who loved him, we now know more – much more – about the peopling of the Americas. And, appropriately, members of the Anzick family, with the cooperation of various tribes in the area, are going to re-bury the boy’s remains, and so return him to his land. Anzick-1 is the little boy. I find it hard to think of him that way. Of the archeological sites which are considered to have signs of pre-Clovis human activity there are four that I want to focus on today, for a reason, which I’ll get to in a minute. When and how people first came to the New World has long been an archeological mystery. Whenever the first Europeans arrived here (either in 1492, and thereafter, or earlier, if you prefer, with Leif Ericsson), they found people already living here. But where had they come from? And how? And when? Beginning in the 1920’s and thereafter, archeologists (and others) began finding large uniquely shaped stone spear points, and thought, “Aha! Here is evidence of the first people to inhabit the Americas.” The points were unique in that they had a distinctive fluting, which permitted the point to be hafted onto a shaft. (See the illustrations.) 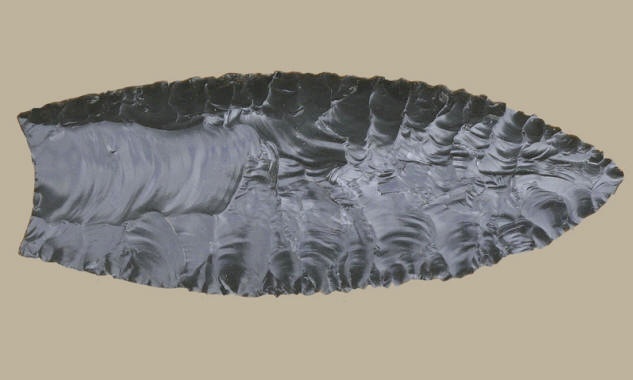 The first of these archaic points was found near the town of Clovis, New Mexico, and the culture that had created these beautiful tools became known as the Clovis culture. The scientists knew these points were old, because, for example, they found some wedged in mammoth bones. And as dating techniques became more refined, the points were dated to roughly thirteen thousand years ago. At the time of the discovery of the Clovis points, and for a long time after that, that there was no evidence of any human occupation before that time, roughly 13,000 years BP (Before Present). So, based on the discovery of these old stone tools, and the absence of evidence of an earlier human presence, the predominant theory developed. The theory is often called the Clovis First theory. That theory was fairly straightforward: During the last glacial maximum, between sixteen thousand and twelve thousand years ago, the sea level was so low that Siberia and Alaska were connected by a vast land bridge called Beringia; and the people who made those Clovis points, the first humans to come into the Americas, had walked across that land; had come here from Siberia, down through Canada, and into the Americas. And the theory was plausible, because at that time, not only were the seas low enough to permit travel from Siberia to Alaska on foot, across the vast land today known as Beringia, but also, because at that time there was an ice-free corridor which would have let the wanderers pass down from Alaska between the glaciers, and so into Canada, and the rest of the Americas. And, at that time there was no evidence to suggest that people had been here earlier. Thus, the Clovis First theory says that those people, who came across Beringia between sixteen thousand and twelve thousand years ago, were the first people to enter North America. And it was thought, that by 13,000 years ago, they and their culture had diffused as far south as Clovis, New Mexico. It was a very neat theory. And, for that matter, it’s a theory that may well reflect (a part of) what really happened. That is to say, it is likely that some people did, in fact, come into the Americas via Beringia, during that time. But – it may be that that was not the only way that people got here; and it also may be that people got here earlier than previously thought. Why? Why these four sites? First, each has evidence of human activity earlier than 13,000 years ago; evidence of the human presence before the Clovis First theory permits. One of the interesting things about archeology is that it isn’t like going to a museum. The discoveries are not complete little villages, all laid out in a neat diorama. There are no complete sets of bows and arrows, just lying around. The materials discovered are often fragmentary, contradictory, and require detailed analysis, and some level of conjecture, before inferences may be drawn, and tentative conclusions reached. To a greater or lesser extent each of these sites is controversial, insofar as each purports to show evidence of human activity before 13,000 years BP, in large part because the evidence is so equivocal. I’ll review the sites in greater detail later, but for now, it’s sufficient to state that each shows (or claims to show) evidence of human activity much earlier than the commonly accepted dates of Clovis culture. How much earlier? A million years? Nope. Three thousand years, four maybe, maybe five thousand years, maybe a little more. I’ve oversimplified a little. As noted above, these sites are dated using radiocarbon analysis and that method generates different dates than calendar dates. There are formulas, however, which allow radiocarbon dates to be translated, roughly, into calendar dates, and using that conversion factor, we can derive evidence of human activity at these sites that goes back as far as 20,000 years BP. Now that is not hundreds of thousands of years, not even tens of thousands of years, but it is thousands of years. Thousands (plural) of years. That’s a long time. Christianity is only two thousand years old; the pyramids were built five thousand years ago. And we’re back way before that, and, for that matter, way before the Clovis dates. Thousands of years earlier. As I say, each site is somewhat controversial. But let us assume, for now, that they accurately show evidence of human activity thousands of years before Clovis culture developed. Look where they are. They’re all on the east coast. They are thousands of miles away from Clovis, New Mexico; thousands of miles away from the ice-free corridor which led down through Alaska and Canada into North America. These sites are way over in the east. Somebody traveled far enough to be way over in Virginia, thousands of years before the Clovis culture began. Who? Where’d they come from? How’d they get here? First, they show evidence that there were people here thousands of years earlier than the Clovis First theory posits. Second, they show that those people, (whoever they were, however they got here, whenever they got here), were widely spread out across North America. Third, the locations suggest that people must have entered North America much earlier than the dates posited under the Clovis First theory, in order to give them enough time have travelled so far. But look at this cool map here. See how it shows routes of travel? The first Americans could go anywhere they wanted (subject to the location of the ice sheets during the various ice ages). Don’t makethe mistake of thinking that just because Clovis points were first found in New Mexico that that was where the Clovis culture began. It’s not as though the first people came over the land bridge, directly down to Clovis, New Mexico, devised this new stone technique and then spread out from there. In fact, Clovis points have been found all over America, and there is no single answer to where it began. Still, it is interesting that once was once considered the first record of the peopling of the Americas is now being superseded by evidence of human inhabitation of the Americas much earlier than originally thought, from sites that are very widely diffused. I’ll bet you’d like the answer, huh? Who were these people? When did they get here? How? Dates are commonly obtained by radiocarbon dating, and the dates are given as RCYBP, which stands for RadioCarbon Years Before Present. Radiocarbon years do not exactly equal calendar years. Under that measure Clovis culture is thought to have begun about 11,500 RCYBP. This translates, however (roughly) to 13000 – 135000 years ago. The whole radiocarbon dating/time scale conversion issue is well beyond the scope of this blog, or this blog entry at least. So for now, let’s just agree that Clovis culture began sometime around about thirteen thousand years ago. I found this map in the article “Prehistoric Migration of American Indians,” by (I think) Katherine Bolman, BS, MFA, MEd, MSW, EdD., at Arthistoryworlds.org. The map itself is attributed to Jose Arredondo. The link to the website is http://arthistoryworlds.org/prehistoric-migration-of-american-indians/. It was a simple story, and probably – probably – too good to be true. Two great vast continents standing open, uninhabited, alone, separated from the rest of the world by two enormous oceans, until the glaciers came, and drew down the sea level hundreds of feet, and so exposed a bridge, a wide corridor of land stretching between and connecting Siberia and Alaska. And no mere footpath – this now-submerged land, Beringia, was hundreds of miles wide, steppe country, treeless, covered with grasses, and sedges, and dwarf willows. Huge clouds of mosquitos swirled over the ponds and streams that ran across the land, but they were not sufficient to bother the great herds that walked that land – the reindeer, the caribou, the horses, and bison, and mammoths, and mastodons. And where the game went, the story goes, the people followed. Up and up, north and east into the shining sun, in the long, long days, following the herds. North and east, ever on, until those people were no longer in Siberia, but now, in Beringia, and sometime later, in Alaska. And then Canada, and the land stood open, and they came in, and so peopled North America. Following the game across the land. A simple story and a beautiful one. This is the theory that has dominated thinking about the peopling of the Americas for decades. These first Americans, so the theory goes, were associated with a specific type of spear point, called a Clovis point, after the town in New Mexico where the ancient points were first discovered. And they arrived in North America sometime – roughly – no one knows for sure – between 11,500 and 13,500 years ago. But – Is the story true? Was that how and when people came to the Americas? And if true, still other questions remain – was that the only way that they came here? And was that the only time? Because there are anomalies. There are doubts. There are questions. There are, in short, other theories, and tantalizing hints of evidence to support them. From the lack of any fossil evidence whatsoever, it is reasonable to conclude that until quite recently both North and South America were entirely uninhabited. And humans didn’t evolve here. Yet when Columbus arrived, he found people here; earlier, when the Norsemen came, they found the skraelings – human beings. So somehow, at some point, humans made their way here, into the Americas. But how? And when? There are really only five ways they could have come. When the glaciers were in full flower, the ocean level was so low that that land bridge, Beringia – hundreds of miles wide – formed between Siberia and Alaska. Maybe, following the game, bands of people came through that way, and then down through Canada. Two: Maybe they sailed along the coast between Siberia and Alaska, and then on down the coast. Three – maybe some people – maybe – sailed along the edges of the glaciers from Europe to Iceland, then Greenland, and island hopped along the Canadian coast and down into north America. Four – maybe bold sailors sailed right across the Pacific. Five – maybe equally bold sailors sailed right across the Atlantic. Maybe they came in different ways at different times. And maybe they came in waves. The problem is, we just don’t know. When did people first come to the Americas? How? Over the next several entries, these are the questions I’ll be looking at.